Finding stories in everyday life and whimsical moments. 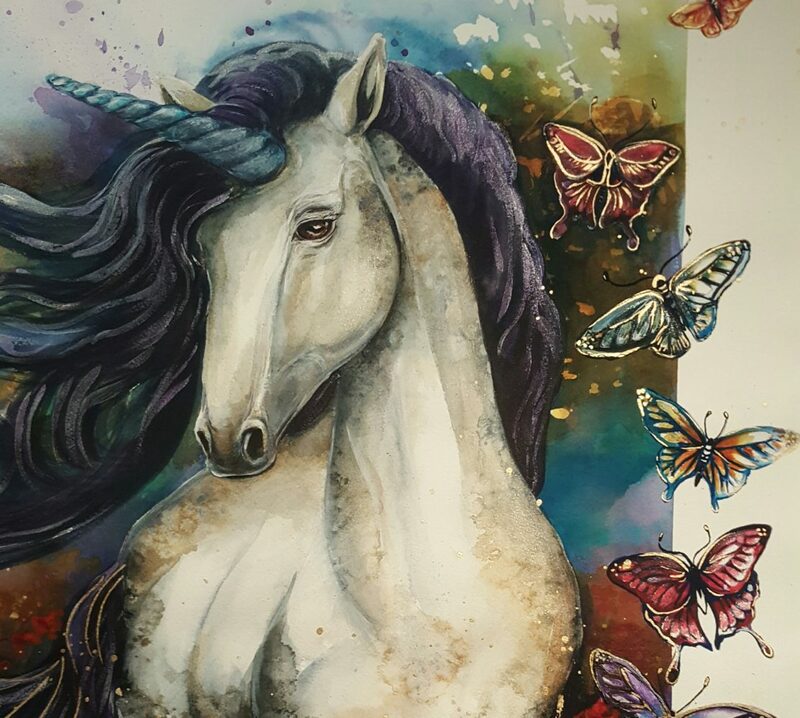 Last year my horse mad 6 yr old Granddaughter asked me to do a painting of a unicorn for her 7th birthday present. I was a little nervous about a unicorn as my subject matter but what developed through the painting was a thought of what I would want her to know if I wasn’t around to tell her. What would I say was important in life if I had to say it simply and clearly. Life I believe is made of many highs and lows and you can never truly stop there being both in your life. To try to keep all bad things from happening, is like trying to hold back the tide. No I would rather try to remember, that even when there are hard times, they can be survived and there will be good times again. Don’t get me wrong I am no Pollyanna I have seen or helped people through some dark times, but if you look for a dream,a hope that there will be better times you tend to find them. The first thing I would want to tell her is to chase her dreams, not in a corny go out kid and chase your dreams but in a clear know who you are and what you want in all parts of your life. So when things get tough you will have a path to follow to see the glimmer of hope. That can make all the difference when you are in the low points, knowing there is hope, when it is hard to see. That if you hold on to the dream of having a happy life you can create the reality and be happy chasing that dream. Why do I think this is a dream and not a goal? because goals have a deadline a finish date, achieve this goal by this date… etc, but our dreams tend to be things that are organic and change and move with us. One of my most important and cherished dreams is to have a happy fulfilled life and that is something I chase and achieve everyday. It is not a goal that I will wait till the end to measure, nor is it a goal that has defined parameters, some times I am happy when I don’t get what I want. Because I got something or someone else and I am experienced enough to know I can respect the day as it is. I wrote the key words of what I wanted for her to know in gold paint in the drips I deliberately let run off the paper. Because I think that is an important key to happiness. Finding the meaningful people and things in the mess or accidental moments. Then building your life on that foundation. What do you think is important in life? BE CREATIVE, in your own way. Spend time with FRIENDS and those who love you, for they will strengthen you. Always LOVE YOURSELF, not in a conceited way, but from your own truth and honesty. Be quick to share LOVE everyone needs it, and it will not run out. Free your IMAGINATION, it will not survive in constraints, not yours or others. RESPECT all and everything will be your teacher and guide. LEARN from every mistake and from every situation and you will always see a gift you can take from it. DREAM BIG, then put one foot after the other on your journey to get there. THERE IS ONLY ONE YOU, don’t compare yourself to others, it waste your time and kill your courage. FOLLOW YOUR DREAMS, especially when its hard, don’t give up. Ask for help, it will come. MAGIC HAPPENS everyday, look for it and you will see it. When others can’t see it for themselves give HOPE for when given, hope grows. YOU ARE SPECIAL, and needed in this world. YOU ARE LOVED,by many, let it start with yourself. YOU ARE ALWAYS IN MY HEART,as I am in yours. SO WE ARE NEVER ALONE.